Gaia flight model during X-axis CoG (Centre of Gravity) and inertia measurements at Intespace, Toulouse, France, 15 March 2013. 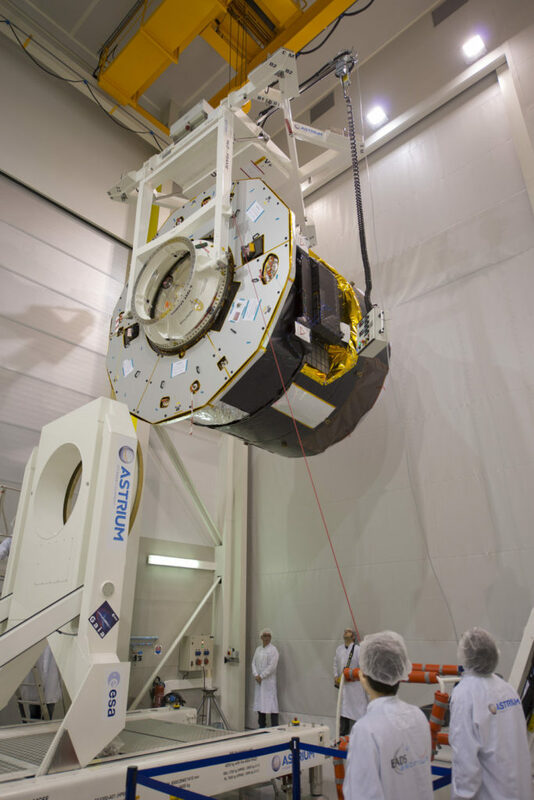 [Via Satellite 10-30-13] To allow the European Space Agency’s (ESA) Gaia program to carry out additional checks on its satellite, Arianespace has switched the order of its two upcoming launches, with full agreement of its customers, moving the Ariane 5 ECA mission for SES and Hispasat ahead of the Soyuz launch for ESA. Launch VA216 is now scheduled for Dec. 6, 2013, and will carry the Astra 5B and Amazonas 4A satellites. The VS06 Soyuz launch for Dec. 20, 2013 will carry ESA’s Gaia Observatory.